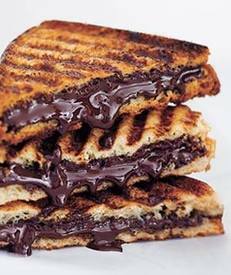 Giada made these unique panini sandwiches using chocolate, basil and brie. Not the first thing that jumps out as ingredients for a sandwich, but as mentioned on these pages, salty, sweet, and savory flavors are great in balance with each other. The richness of the chocolate plays nicely with the bite of the brie. Couple this with the freshness of basil and you have a fun sandwich.